We have a truly new exciting product line for you. 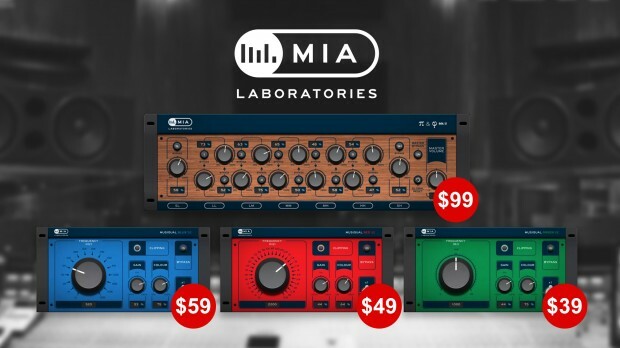 MIA Laboratories develop the highest quality emulations of prestigious analog studio mixing effects that we have ever heard. They are available now for you to discover at great introductory prices. This entry was posted in DontCrack, Plug-ins, Promotions and tagged MIA Laboratories, MIALAB BUNDLE, Musiqual BLUE SE, Musiqual GREEN SE, Musiqual RED SE, Musiqual Series BUNDLE SE, Musiqual Series EQ, Pi and Phi, Pi and Phi MkII. Bookmark the permalink.